While looking at startups in the outdoor industry, we’ve noticed that adventure discovery tools are a common idea entrepreneurs try to turn into businesses. There are several people out there who have acknowledged the difficulty of finding new activities to do and want to offer a solution. We’ve encountered apps, websites, and other services that try to solve the problem, but the one that has stood out amongst its competitors is: The Outbound Collective. Upon first discovering The Outbound Collective, we were immediately blown away by the site’s fantastic concept and beautiful presentation. 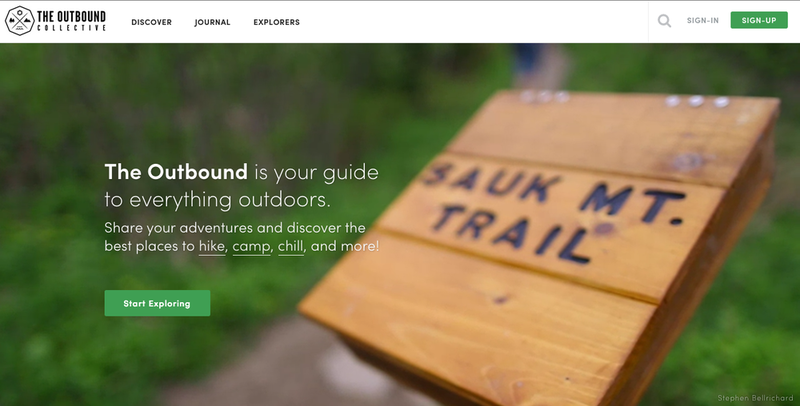 Essentially what The Outbound offers is a curated platform which compiles stories, information, and tips about exploring the outdoors so that anybody can use it to inspire their own exploration adventures. While this might sound similar to many other existing adventure discovery tools, we recognize that The Outbound stands out because of the efficient and well-targeted model it follows. When founders Brian Heifferon & Tyler Drake (both graduates from Stanford University) partnered to launch The Outbound in early 2012, they wisely latched onto Instagram as a tool to fuel their own work. They developed a crowdsourcing method for their website by reaching out to major influencers from Instagram — those with strong storytelling talent, travel experiences, and a substantial following — and asked them to collaborate and contribute original content to The Outbound. Today, the site has grown into a massive collection of both professional and amateur explorers who love to share their adventures with the public and are passionate about motivating others to do the same. What’s particularly impressive is that the content is well tailored to captivate the millennial generation. How so? Millennials are curious and interested in dabbling in a variety of activities without developing an expertise, and The Outbound offers an opportunity for people to quickly learn about and try any kind of outdoor activity first-hand, regardless what their previous experience is. Not only is the site a great tool for anybody around the world looking to get outdoors, Brian and Tyler’s work has presented people the chance to connect with hundreds of others who share a common interest in embracing the world. If you haven’t already, we highly recommend checking out >>> The Outbound Collective. Don’t miss out on using this amazing tool to get started on your own adventures.